Apna Haq’s CEO, Zlakha Ahmed, was nominated for and has won an award in South Yorkshire’s first ever Al Nisa awards. 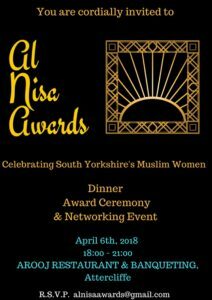 The Al Nisa Awards were founded by FaithStar and take place to celebrate the achievements of Muslim women in South Yorkshire. Zlakha was nominated in the category of Community and Humanitarian because of her commitment to support black and minority ethnic women and girls in Rotherham to escape violence. The awards give Muslim women in South Yorkshire a platform to share awareness of their work in the community and gather support and contribution for their cause. Apna Haq would like to congratulate Zlakha Ahmed for her well-deserved award.